We’re a SaaS company that’s passionate about helping organizations improve sales execution and streamline productivity. Through our sales enablement solutions, we give companies a way to enhance the key revenue-generating activities that have the biggest impact on sales success—planning, preparing and engaging buyers. We got our start in 1990 as a specialized presentation management solution. We’ve come a long way since then, expanding our products and services to become the global leader in sales enablement technology. Now, unlike any other sales enablement software vendor, our products are used by companies in more than 100 countries around the globe. Accent’s company success is all due to our team of talented and creative employees. At Accent, we work hard and we play hard. Our philosophy is that when you enjoy what you do, you’re going to do it well. That’s why we try really, really hard to make Accent a fun and exciting place to work. To learn more about what it’s like to be part of the Accent team, visit our careers page. The founder of Accent Technologies, Pete’s vision for sales enablement has led Accent Technologies to become the global leader in sales enablement technology. Under Pete’s leadership Accent has acquired many large cap clients such as Goldman Sachs, UBS, WebMD, Lockheed, Siemens, McKesson, DHL, Bank of New York, Trip Advisor, William Blair, AMD, Goodyear, and Analog Devices among many others. Pete is also a former infantry officer and graduate of the US Military Academy at West Point. 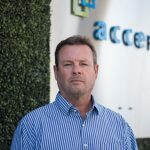 Guided by the sales enablement principles that drive Accent’s products and services, John oversees the key operations that culminate in Accent Technologies’ success as a company. After graduating from UCF, John joined Harris Corporation and managed a series of advanced “black ops” engineering research projects resulting in multi-million dollar government contracts. He was selected to be the top engineer for the commercial wireless radio-in-silicon project that today we know as Wi-Fi. It’s hard out there for B2B companies. Quotas are higher, budgets are tighter and buyers are expecting more and more. Sales and marketing teams are trying to engage with buyers and sharpen sales execution, but the average company simply doesn’t have the visibility and resources needed to strategically approach improvement. Here’s the big problem: Most sales tools (especially CRM) don’t help B2B sales reps sell, and they certainly don’t help both sales AND marketing. They don’t help teams plan, prepare and engage with buyers comprehensively and systematically. A scientific, data-driven approach to B2B selling—one that provides real insight and surfaces the right priorities, resources and coaching at the right time through innovative technology. Technology that improves productivity and gets reps focusing on high-value selling activities. Technology that brings marketing into the game so they can directly impact revenue generation. Technology that stands out with prospects and simplifies the buying process. That’s our philosophy on B2B sales. That’s why we do what we do. Questions about sales enablement? Product features? Favorite sales movie? (It’s Tommy Boy) Whatever the reason, we’d love to talk. Find out about Accent’s career opportunities and what makes Accent such a great place to work (we’re a tiny bit biased). Still have questions? You’re not alone. Our FAQ page covers more info about our company and sales enablement in general.